This ‘ere be ‘Football Boots We Have Loved’, in which we have a look back at some of the football boots which have tugged on our heartstrings down through the years. In a sport which only really requires you to supply a minimal amount of gear, your boots take on an added sentimental significance. You find a good pair and you stick with them; through thick and thin, from dog turd-strewn park to dog turd-strewn park. It’s a special bond. 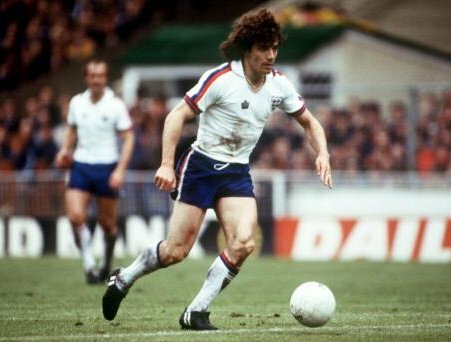 Granted, they weren’t half as cool as Kevin Keegan’s signature pair (which, according to his autobiography, he wasn’t actually very fond of! 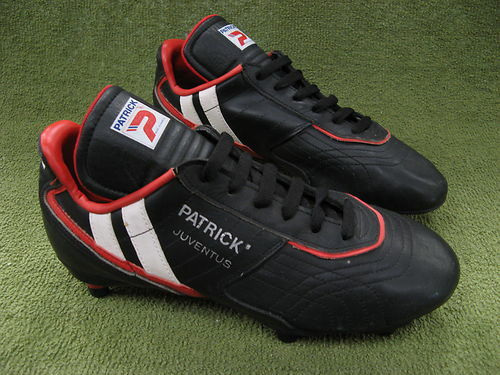 ), but what you see before you on the screen are the very first pair of proper football boots I ever owned: Patrick Juventus. Worn throughout my debut season in the U12s, I scored two hat-tricks from central midfield in these babies leading to them being dubbed – mainly by yours truly – as the ‘Hat-trick Patricks’. Let me tell you, punters flocked from far and wide to see me dazzle in my Juventuses’s’s’s. Okay, ‘far and wide’ (and ‘dazzling’ for that matter!) may be stretching it a little. 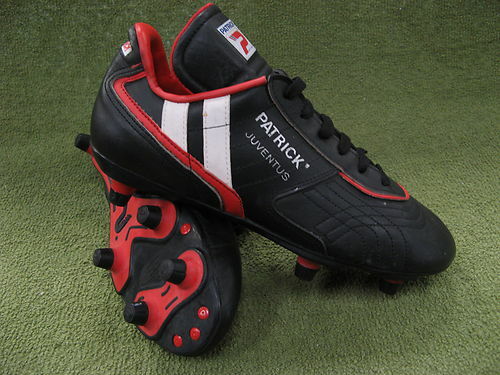 As finances dictated back then, I wore the Juventuses till they fell apart at the seams and loved them so much that I opted for Patrick – not the most popular boot brand in the early 1990s – for my next two pairs until I caught the Nike Tiempo bug a few years later. That said, I feel I owe my entire footballing career to Patrick Juventus. As for Patrick the brand; they still exist, of sorts. 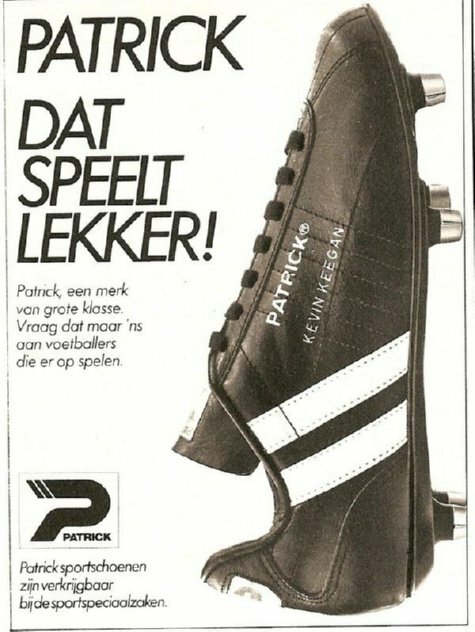 Despite being somewhat popularised in the late 1970s and 1980s after adorning the feet of Keegan and Michel Platini, Patrick were quickly strong-armed out of the picture by the likes of Adidas and Nike due to them being, in all honesty, a bit naff. A couple of Belgian teams currently have their kits produced by the company, but the brand – having originally operated out of a factory in France – have since been swallowed up by some instantly unidentifiable sportswear conglomerate and now seem to, by and large, solely produce rock-bottom budget boots and the like. Not that they were ever the best quality to begin with – just ask Keggy! thanks for forcing me to watch an advert Pies, will just finishing this comment then will sadly go and remove the bookmark I have for your site as I sadly won’t be coming back now that you think that sh*t is cool. I had a pair of Patrick Stabil’s that I wore all through college. I even went so far as to have a shoe maker remove the stripes from them and sew on the stripes from one of the pairs the university gave me because of their sponsorship deal. Of course they still said Patrick on the bottom and I got busted in the school paper one time when the bottoms showed up on the front of the sports page. Still some rockin boots for hard ground and turf. Diadora Turf Stars and Tardeli’s were the other boots everyone “had” to have. @Mizman: That’s about all they’re good for really! Had to check out the Patrick website and discovered this gem!